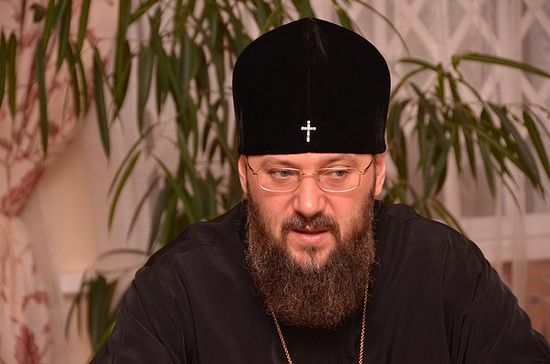 Metropolitan Anthony of Boryspil and Brovary, executive secretary of the Ukrainian Orthodox Church, has reported occurrences of open aggression by the so-called Kiev Patriarchate against the Ukrainian Orthodox Church and its believers and clergymen. He announced this in an interview with the official website of the Ukrainian Orthodox Church (UOC) on October 13. “The UOC has been constantly blackmailed since February 2014. The head of the Kiev Patriarchate’s Ukrainian Orthodox Church has encouraged people, I quote, ‘to put pressure’ on our Church several times… The only clergyman who willingly joined the separatists was a priest from the Kherson Diocese of the UOC. Back then, villagers were encouraged to hold ‘referendums’ on choosing the jurisdiction for the church in their village. A great number of people disagreed with leaving the canonical Church and joining the separatists. In order to suppress their constitutional rights, a right for physical force is used nowadays. Documents are falsified, locks are broken, and people get beaten and pushed out of churches,” the executive secretary mentioned. “Everyone remembers how the KP-UOC demanded negotiations with our Church. Today the form of a dialog with the so-called Kiev Patriarchate is irrelevant. Its head believes that the use of the techniques of illegal seizure and robbery are much more effective. Riding the waves of populism, there is sufficient political muscle ready to provide physical force for the Kiev Patriarchate in such activities,” Vladyka Anthony noted. The executive secretary of the UOC described the scheme that invaders of the UOC’s churches usually use. In addition, he emphasized the difference between the voluntary transfer of a parish to the jurisdiction of the KP-UOC and an invasion. “A decision regarding the transfer of a parish to another jurisdiction can only be made by a parish council chaired by the rector of the parish church. Governmental agencies have a right to register the changes in the parish charter only on the condition that the diocesan hierarch has approved the decision of this council. This is a typical procedure not merely for the UOC, but also for all Ukrainian religious institutions, the KP-UOC included. Moreover, according to the law, if there are only ten people in an inhabited locality who are unwilling to transfer from the UOC to another jurisdiction, no one has any right to eliminate their parish. In any other case, this is an invasion,” the Metropolitan stressed. According to Metropolitan Anthony, representatives of the Ukrainian Orthodox Church of the Kiev Patriarchate have seized ten churches of the Ukrainian Orthodox Church. These churches are situated in the regions of Rivne, Lutsk, Ternopil, and Lviv.